How do I filter video posts by video length? In the post stream, filter first by "Facebook Videos" then go to "More" and adjust the video length slider. Where can I view video length metrics? View video length on any video post. Filter the post feed by video length via a slider (for example, to view posts over 3 minutes long) and sort by interactions or overperforming. 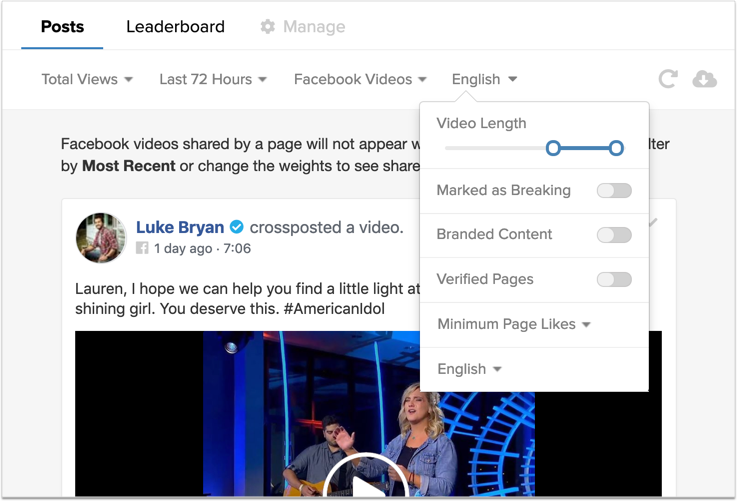 In Intelligence, explore video views and video count by video length. This will also surface percentage of 3min+ videos. Filter notifications to only send for videos of a certain length. Filter the notification to include only Facebook videos, and the video length slider will appear. Export video length data from the post feed, leaderboard, and other historical data surfaces. 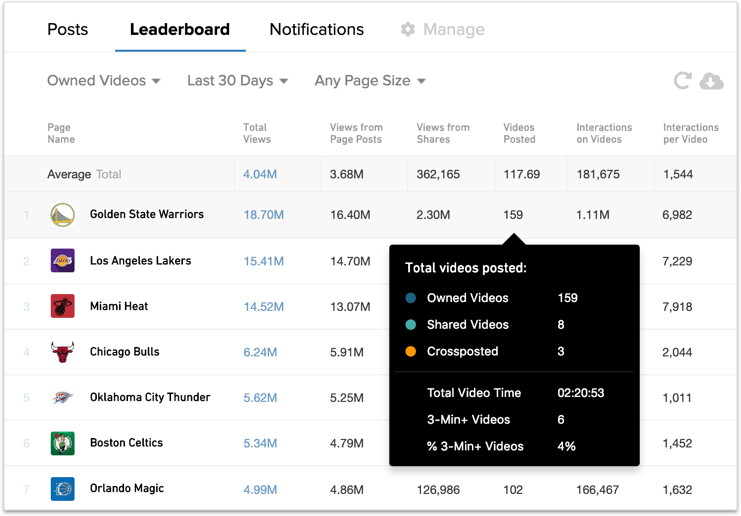 In the Owned Video Leaderboard, see total view time, and the total number of — and percentage of — 3min+ videos (in hover and export) on the page level. What are some use cases for video length? 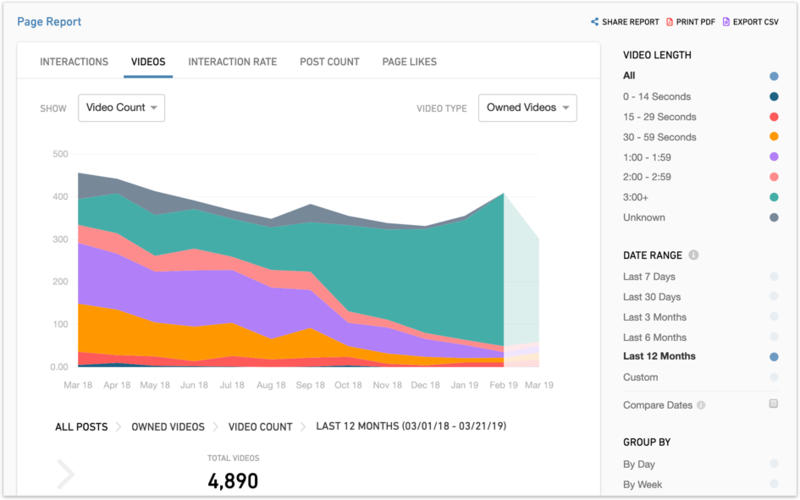 Compare how many monetizable videos you're posting vs. competitors, across all of their Pages and brands, and increase revenue by optimizing your video strategy based on performance by video length. Figure out the optimal length for a 3m+ video. Are we talking 3 minutes? 5 minutes? 8 minutes? Easily surface videos between 2:30-3:00, on the cusp of monetization. Deduce content strategy differences between short and long videos — which topics work better longer vs. shorter? What are the view differentials? What about the Facebook Live post type? Facebook Live posts are excluded from the Total Video Time and 3min+ Video bucket because they are not monetizable. Why do you have "Unknown" as a video length? In some cases, the video is categorized as a video but video length is unavailable. There are few edge cases like GIFs and videos added to a Facebook album where we cannot fetch the video length. Also, targeted posts are typically not caught by CrowdTangle, but in cases where we have them, the video length will be unknown. How far back does this data go? As of March 21st, 2019, we have historical data going back to the beginning of 2018. Over the next week, we will continue to backfill. We hope to have video length data back through 2015! Do you have video length data on Facebook group posts or verified public profiles? No, video length is only available for posts on Facebook Pages. Is video length available via the CT API? Not yet, but we hope to make it available soon. When are you adding video length to Instagram? We have no plans right now to add video length to Instagram. My video length in CrowdTangle is different from what the player shows. What's going on? It seems so easy to know how long a video is, right? It turns out there are actually lots of different ways to determine the length (e.g. how long the audio is, or how long the visual portion is); and on top of that, there are different encodings (e.g. MP4, VP9), which all calculate length differently. So there's a small chance that the length of a video could be slightly off (by a second or two) from what you expect.